Be the first to share your favorite memory, photo or story of Rita. This memorial page is dedicated for family, friends and future generations to celebrate the life of their loved one. It is with great sadness that the family of Rita Blagus announce her passing on April 9, 2019 in Cape Coral, Florida at the age of 84. She was one of six children born to Mary Margaret and Harry Mellott. A graduate of Central Catholic High School in 1953, Rita went on to marry her best friend and love of her life, Ronald E. Blagus. The two were most proud of their 50 year marriage and were blessed with raising their 4 children at Christ the King Parish since 1962. She happily dedicated her life to staying home to raise their family. Later, Rita became the Parish’s first school secretary and proudly held that position for 19 years. During that time, she established many life long relationships with the staff, students, and their families. Rita and Ron went on to enjoy spending the winters in Sarasota, Florida where they formed many new friends with whom they shared countless fun and fond memories. Siesta Key was heaven on earth for Rita and her family, especially her grandchildren. Walks and cookouts on the beach, boat rides, sandcastles, cherishing those captivating sunsets and warm family memories that are too countless to mention will be with us for the rest of our lives. Thank you Mom and Dad. She will be sorely missed and is survived by her Son, Ron (Mari) Blagus, Daughters, Marcia Voyles (Bradley Snyder), Sharon Kopf (Tim Guitteau), Barb (Jeff) Gill, Grandchildren, Daniel (Timmery) Voyles, Joe Voyles, Taylor Kopf (Thomas Minch), Michelle Kopf, Alex Kopf, Melinda (Stephen) Wolf, Christopher Gill, Brittany (Phil) Abejean, and Great grandchildren Graysie, Ryleigh, Zachary, Brodie and Nicholas, all whom loved her dearly and admired her tenacity, charm, perseverance and unconditional love. Rita’s children, grandchildren and great-grandchildren were the center of her life. She treasured the holidays with her family and the one on one conversations with her grandchildren. Rita’s faith and love for the Catholic Church was unparalleled and she freely shared that faith and Christ’s teachings with her family and her friends. Rita was also blessed with a very close circle of Toledo friends that she adored for years. She especially looked forward to their Margarita Mondays which were filled with laughter, sarcasm and youthful energy. 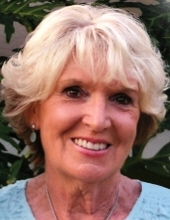 Rita also had a love for golf, music, college football and her favorite pastime, shopping. Needless to say, most of her interests will continue to be shared by her family. Respects and tributes for Rita will be held at Walker Funeral Home, 5155 W. Sylvania Ave., Toledo on Monday, April 15, 2019 from 4-7 p.m. with a prayer service beginning at 7 p.m. Funeral Mass will be held at Christ the King Parish, 4100 Harvest Ln., Toledo on Tuesday, April 16, 2019 at 10:30 a.m. Interment will immediately follow at Toledo Memorial Park. Memorial contributions may be sent to Hospice of Northwest Ohio. To send flowers or a remembrance gift to the family of Rita Anne Blagus, please visit our Tribute Store. "Email Address" would like to share the life celebration of Rita Anne Blagus. Click on the "link" to go to share a favorite memory or leave a condolence message for the family.